Theresa Shaw stands in a greenhouse at Shiloh Valley Family Farm as dark storm clouds fill the sky. Her youngest son, 5-year-old David, hangs on her hip as she begins her story. Theresa grew up on a conventional farm in Miles City in southeastern Montana. She went into the Reserve Officers’ Training Corps at Montana State University where she met her husband, Chris Shaw. Both Theresa and Chris served in the Air Force. Theresa served as a Special Agent with the Air Force Office of Special Investigations for five years. Chris served as a Civil Engineering Officer for nine. “When my husband and I got out of the Air Force we knew we wanted to farm and we ended up in Sheridan,” she said. 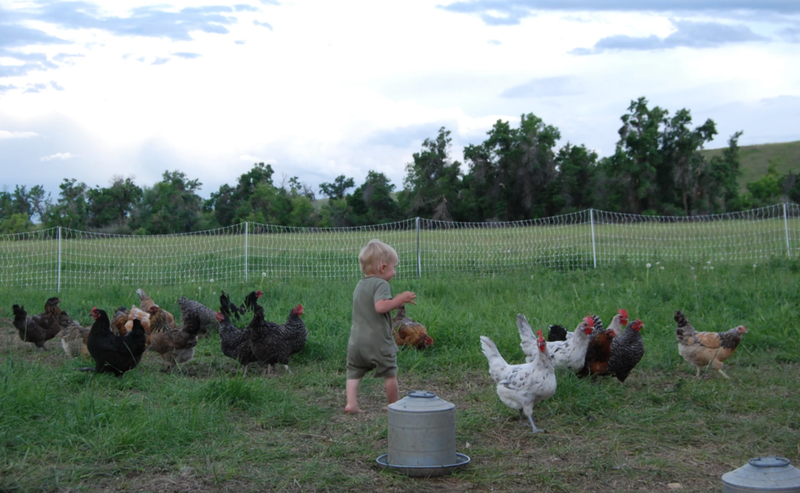 Theresa and Chris run Shiloh Valley Family Farm with their four children. Chris studies online through Montana State University on the GI Bill. He’s working on a masters in education, while teaching as an adjunct professor at Sheridan College. Theresa runs the farm full time, while homeschooling their children. Livestock labeling in general has become a hot-button issue at the national level. The U.S. Department of Agriculture (USDA) recently began to accept public comments on a rule that allows meat processors to import foreign-raised grass-fed beef, run it through a USDA inspector, and slap a “Product of the USA” label on it. This practice helps slaughter companies undercut market prices, hurting American producers. It also encourages deforestation in Latin American countries, where would-be ranchers clear acres of rainforest to pasture cheap beef bound for a trip north and a “Product of the USA” sticker. Production practices in the Shaw family are the opposite of the suspicious USDA labeling practices. Shiloh Valley Family Farm reflects the family’s belief in honesty, sustainability and diversity. Although they are not certified organic, the Shaws feed their livestock organically grown grain in addition to their grass-fed diet. The family doesn’t use any pesticides or chemicals on any of their food. Their production values stem from the Shaw’s wanting the best food possible for their own family. “We started out with wanting to teach our kids where their food comes from, respect for animals, respect for the land and just wanted to feed them really healthy food.” That blossomed into producing sustainable, wholesome food for their entire community. All of the Shaw children help out on the farm. The sense of community that comes from growing food helps fuel the Shaw operation. “I guess growing up on a farm really formed who I am, and I wanted to recreate that sense of community and family entrepreneurship with my own family and my husband decided that that was a good idea, too,” she said. The U.S. Senate recently stepped up its support for farmers like the Shaws. Included in the Senate draft of the 2018 Farm Bill is more funding and protection for a program that pays for technical training, business planning, farmland access, and other supports for beginning, military veteran, or socially disadvantaged farmers. The new Farming Opportunities, Training, and Outreach Program combines the Beginning Farmer and Rancher Development Program and the 2501 Program (a program aimed at helping socially disadvantaged farmers) will help lift an entirely new group of farmers. Both of the old programs were threatened with being cut in recent Farm Bill cycles. The Senate bill combined the two, made them permanent, and grants them 50 million dollars in annual funding with an additional 50 million dollars in discretionary spending. A conference committee will work out the two different versions of the Farm Bills passed by the Senate and House of Representatives.